Audi’s new flagship SUV is supposed to look and drive sportily, but it isn’t exactly that probably for the right reasons. While BMW and Mercedes-Benz have been churning out sporty SUVs for quite some time already, Audi has only begun selling one in the guise of the Q8. Conceived as a competitor for the X6 and GLE Coupe, the Q8 makes a rather timely landing because both of its opponents are aging in their current generations and are about to be renewed later this year. Since the X6 and GLE Coupe are essentially sporty derivatives of the X5 and regular GLE, you could say that the Q8 is merely a racy sibling of the Q7. Well, not quite. Unlike its fellow rivals, the Q8 hasn’t been developed in tandem with the Q7. Instead, the Q8 comes nearly three years after the Q7 was launched in its current generation. Take the styling as an example. The Q8 has been bestowed with the brand’s new design language that will eventually appear in other SUVs. 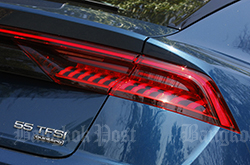 The chunky grille and wide strip for the rear lamps are considerably different from those seen in the Q7. The interior of the Q8 is also substantially distinct by gaining the latest digital screens first applied in the A7 Sportback and A8 luxury sedan (and now the A6, as well). It certainly lends a sense of modernity for the Q8. In fact, don’t be surprised to see such a cockpit in the facelifted Q7 due later this year. In order to lift its sporty appeal, the Q8 gets racy-looking front seats that are reasonably good to sit in. Combined that with a full electronic fascia, the interior of the Q8 is a nice place to be in. While the X6 and GLE Coupe have heavily raked rooflines to underscore their sporty intentions, it feels more subtle in the Q8. Because of that, the Q8 scores with plenty of headroom for rear passengers. It certainly feels more airy than in the BMW and Merc. 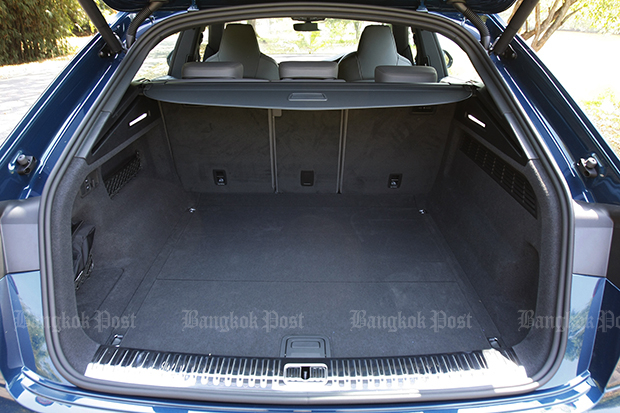 While boot space is never going to beat that of the functional Q7, the cargo area in the Q8 is still designed well to be easy to use. The rear backrests can fold down but not flat. 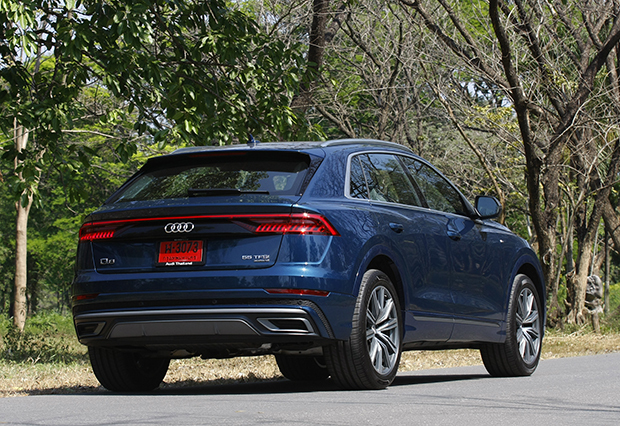 The Q8 appears to be more practical than the X6 and GLE Coupe, although that might not be a major priority for potential buyers because there’s always the Q7 to choose from. As SUVs of this genre are about image and lofty marketing positioning, Audi has chosen to equip the Q8 with six-cylinder power. Like in the X6 and GLE Coupe, four-pot versions aren’t due in the Q8, according to people at Audi. 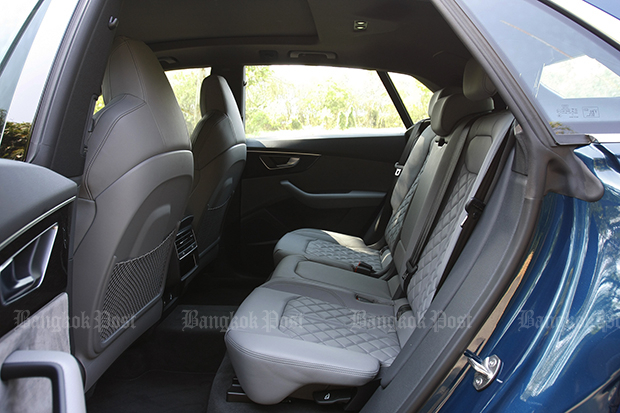 The Q8 available in Thailand is powered by 340hp 3.0-litre V6 petrol-turbo also used in the A6 Avant, A7 Sportback and A8. Likewise, the Q8 has 48V mild hybrid to allow the engine to shut down during coasting and when reaching standstill. It may not drastically cut fuel bills but it certainly helps reduce CO2 emissions to a certain degree. But it’s the internal combustion engine that beckons more. Like in those other Audis, the Q8 has rapid, effortless and refined pace from whichever engine speed. If it’s quick and serene performance you’re after, the Q8 is it. Keener drivers may find the drive selector useful as the engine can be made more responsive in Dynamic mode. But it’s where the air suspension becomes too harsh on uneven road surfaces. It’s best to either utilise Auto or personalise the various parameters in Individual. 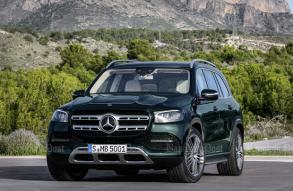 Normally the driving characteristics of sporty SUVs are beefier than their regular relatives. 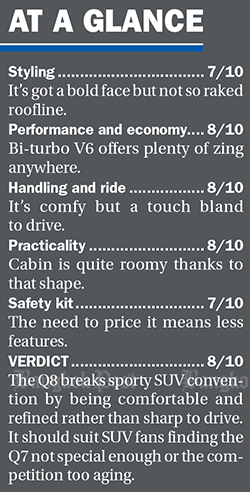 However, there’s only a small difference between the Q8 and Q7 whereby the former still tends to prioritise comfort over handling sharpness. Even though the Q8 rides on 21-inch wheels, it feels sufficiently quiet and refined. And while the steering is light for normal use, it doesn’t feel as engaging as the X6 or GLE Coupe in more demanding road conditions. Plus, you can feel the Q8’s size and weight in city driving. You could argue that sporty SUVs should be convincing to drive because that could be one reason why someone would abandon a Q7 for Q8. 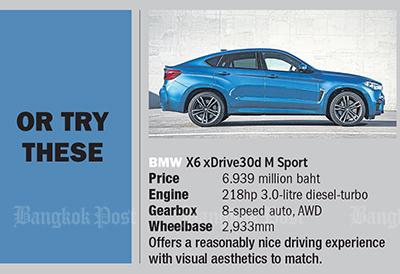 But let’s also not forget that many others love the looks of a sporty SUV but merely need a cajoling driving experience. Audi’s formula could prove effective and only time will tell. 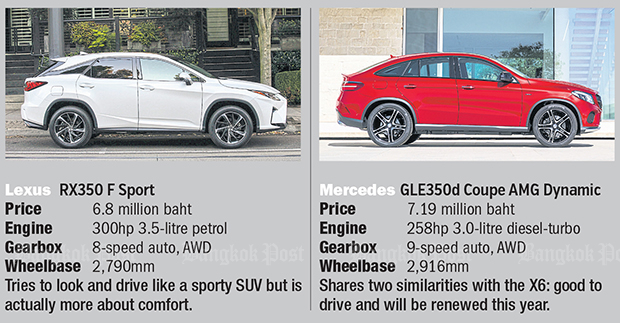 Anyone hoping for a gadget-laden Q8 may have to think twice because the Thai Audi agent had to price it below seven million baht in order for it to be competitive against the competition. The Q8 in 55 TFSI form is the only model in its class to spew more than 200g/km of CO2, hence the 35% excise tax. 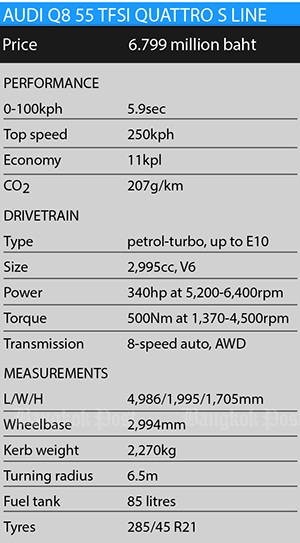 There is the 50 TDI version in Europe developing 286hp and spewing less of that black soot. 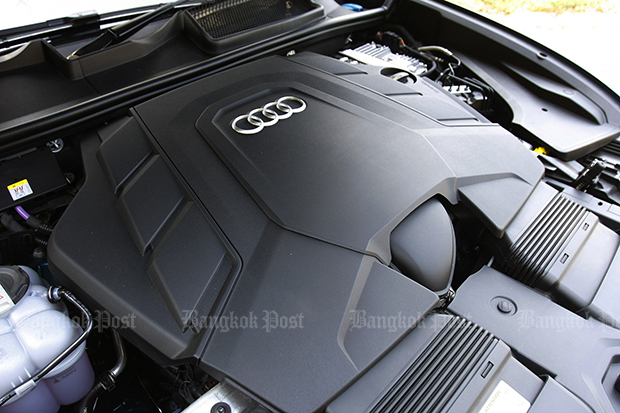 But Audi isn’t too keen about diesel in Thailand despite having it in the Q7 to choose from. 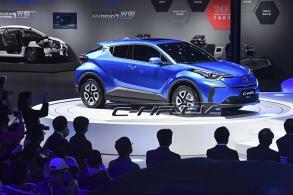 And as said earlier, there are no plans for a four-pot Q8. 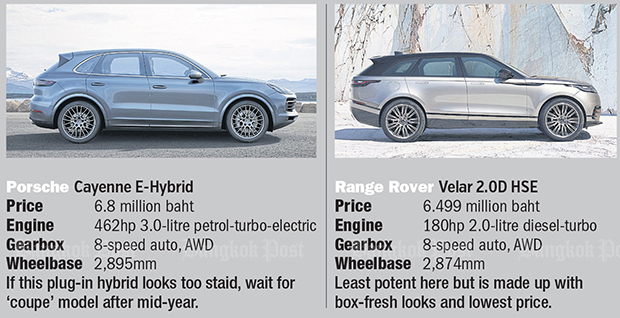 Even so, buyers with this kind of money to spend should still find the Q8 an interesting alternative in this corner of the luxury SUV market. 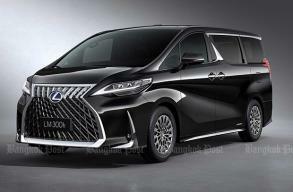 It has box-fresh looks, neat and roomy interior and refined driving experience many buyers in this part of the world should like. 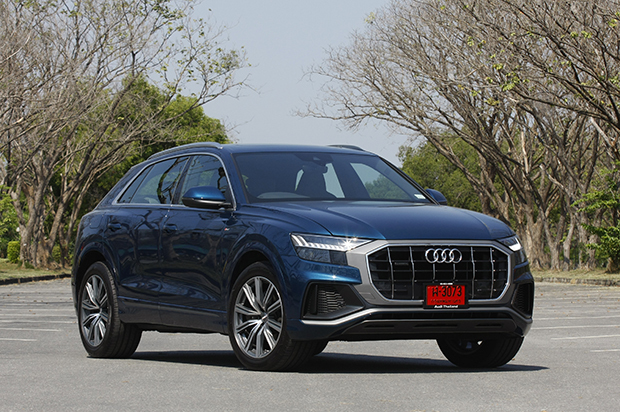 Audi may be late to the sporty SUV party, but it has come up with one that has defied some convention for the sake of what a luxury car should really be.